Submitted by dennis on Sunday, September 3, 2006 - 8:04pm. This restaurant is located right behind Carl’s Jr in the food plaza. Its a small but comfortable place. Hai and I decided to eat here because I wanted to try something in Miramar. I don’t eat in Miramar that often so I thought it would be a great opportunity to review some place new! Today I ordered the Combination plate for $7.99. 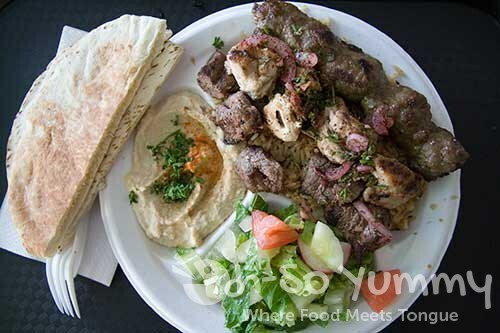 It includes beef, chicken, and kafta kabobs with basmati rice, hummus, salad, and pita bread. At first sight, I thought I was jipped on the rice. Being big rice man, I love to have my rice to meat ratio of about 2:1 or so. But after eating all my rice, I started packing my meat into a pita bread spreaded with hummus and cilantro. Result? Tasty! About the flavors here, I thought it was interesting. I haven’t had Lebanese food before but if its made like this, then I’m all up for it! The chicken here is marinated with lemon sauce, the kafta was tangy, and the beef was just about right. The end result, I walked away full and happy. Yippee!